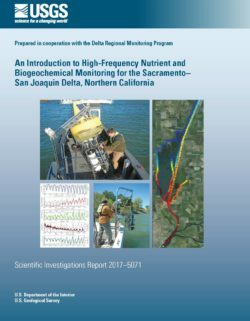 This report is the first in a series of three reports that provide information about high-frequency (HF) nutrient and biogeochemical monitoring in the Sacramento–San Joaquin Delta of northern California (Delta). This first report provides an introduction to the reasons for and fundamental concepts behind collecting HF measurements, and describes the benefits associated with a real-time, continuous, HF, multi-parameter water quality monitoring station network that is co-located with flow stations. It then provides examples of how HF nutrient measurements have improved our understating of nutrient sources and cycling in aquatic systems worldwide, followed by specific examples from the Delta. These examples describe the ways in which HF instrumentation may be used for both fixed-station and spatial assessments. The overall intent of this document is to describe how HF measurements currently (2017) are being used in the Delta to examine the relationship between nutrient concentrations, nutrient cycling, and aquatic habitat conditions. 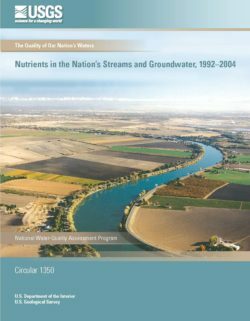 The Sacramento-San Joaquin Delta (the Delta) receives high loads of the nutrients nitrogen (N) and phosphorous (P) from wastewater treatment effluent and agricultural runoff. Flows from the Sacramento River, San Joaquin River, and other tributaries transport these loads through a complex network of rivers, channels and flooded islands, before entering San Francisco Bay. Excessive loads of N and P can adversely impact ecosystem health by causing excessive algal blooms and low dissolved (Valiela et al, 1992; Kamer and Stein 2003). Excessive nutrients may also contribute to the occurrence of harmful algal blooms (Bates et al, 1989) and overgrowth of nuisance aquatic macrophytes (Valiela et al, 1992). Major nutrient management decisions are being considered in both the Delta and San Francisco Bay, and those decisions require the best-available science to understand the factors that regulate ambient conditions, and the effects of loads and ambient conditions on ecosystem health. A mechanistic and quantitative understanding of nutrient cycling and fate in the Delta is essential both for informed decisions related to current conditions and also because of major anticipated changes in both loads to the Delta (upgrades at wastewater treatment facilities) and habitat function due to restoration efforts and water management. We hypothesized that the Delta is an important biogeochemical reactor, and that transformations or losses strongly regulate ambient nutrient concentrations within the Delta and modulate nutrient loads to San Francisco Bay. Both N and P have complex cycles and require careful investigation. In this paper, we focus on nitrogen, including loads, cycling, and losses or transformations that influence its ultimate fate. This report is the third in a series of three reports that provide information about how high-frequency (HF) nutrient monitoring may be used to assess nutrient inputs and dynamics in the Sacramento–San Joaquin Delta, California (Delta). 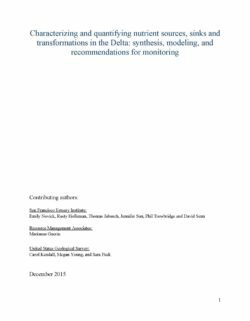 The purpose of this report is to provide the background, principles, and considerations for designing an HF nutrient-monitoring network for the Delta to address high-priority, nutrient-management questions. The report starts with discussion of the high-priority management questions to be addressed, continues through discussion of the questions and considerations that place demands and constraints on network design, discusses the principles applicable to network design, and concludes with the presentation of three example nutrient-monitoring network designs for the Delta. For three example network designs, we assess how they would address high-priority questions that have been identified by the Delta Regional Monitoring Program (Delta Regional Monitoring Program Technical Advisory Committee, 2015). This report, along with the other two reports of this series (Kraus and others, 2017; Downing and others, 2017), was drafted in cooperation with the Delta Regional Monitoring Program to help scientists, managers, and planners understand how HF data improve our understanding of nutrient sources and sinks, drivers, and effects in the Delta. The first report in the series (Kraus and others, 2017) provides an introduction to the reasons for and fundamental concepts behind using HF monitoring measurements, including a brief summary of nutrient status and trends in the Delta and an extensive literature review showing how and where other research and monitoring programs have used HF monitoring to improve our understanding of nutrient cycling. The report covers the various technologies available for HF nutrient monitoring and presents the different ways HF monitoring instrumentation may be used for both fixed station and spatial assessments. Finally, it presents numerous examples of how HF measurements are currently (2017) being used in the Delta to examine how nutrients and nutrient cycling are related to aquatic habitat conditions. 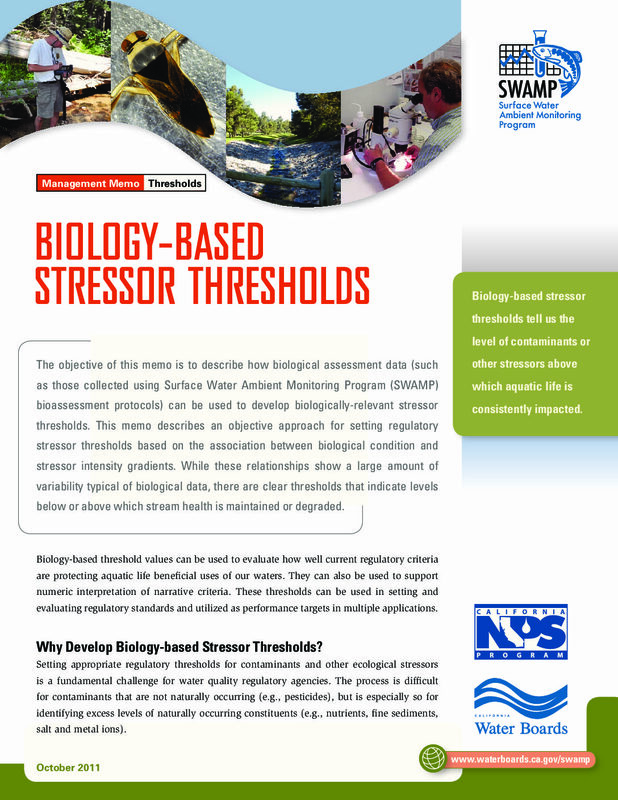 promotion of water quality restoration and protection on a watershed basis. A key part of the Action Plan provides for expanded efforts to reduce nutrient overenrichment of waters. Nutrients, in appropriate amounts, are essential to the health of aquatic systems. Excessive nutrients, however, can result in excessive growth of macrophytes or phytoplankton and potentially harmful algal blooms leading to oxygen declines, imbalance of aquatic species, public health threats, and a general decline in the aquatic resource. Recent reports on water quality conditions provided by States indicate that nutrients are the leading cause of impairment in lakes and coastal waters and the second leading cause of impairment to rivers and streams. Nutrient overenrichment has also been strongly linked to the large hypoxic zone in the Gulf of Mexico and to recent outbreaks of the toxic microorganism Pfiesteria along the Gulf and Mid-Atlantic coasts. The Action Plan calls on EPA to accelerate the development of scientific information concerning the levels of nutrients that cause water quality problems and to organize this information by different types of waterbodies (e.g. streams, lakes, coastal waters, wetlands) and by geographic regions of the country. EPA is also to work with States and Tribes to adopt criteria (i.e. numeric concentration levels) for nutrients, including nitrogen and phosphorus, as part of enforceable State water quality standards under the Clean Water Act. Increasing clarity of Delta waters, the emergence of harmful algal blooms, the growth of aquatic water weeds, and the altered food web of the Delta have recently brought nutrient dynamics to the forefront. This paper focuses on the sources of nutrients, the transformation and uptake of nutrients, and the links of nutrients to primary producers. The largest loads of nutrients to the Delta come from the Sacramento River with the San Joaquin River seasonally important, especially in the summer. 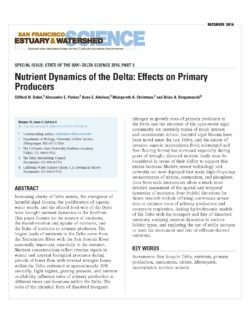 Light regime, grazing pressure, and nutrient availability influence rates of primary production at different times and locations within the Delta. Modern sensor technology and networks are now deployed that make high frequency measurements of nitrate, ammonium, and phosphate. Data from such instruments allow a much more detailed assessment of the spatial and temporal dynamics of nutrients. Four fruitful directions for future research include utilizing continuous sensor data to estimate rates of primary production and ecosystem respiration, linking models of the Delta with the transport and fate of dissolved nutrients, studying nutrient dynamics in various habitat types, and exploring the use of stable isotopes to trace the movement and fate of effluent-derived nutrients. 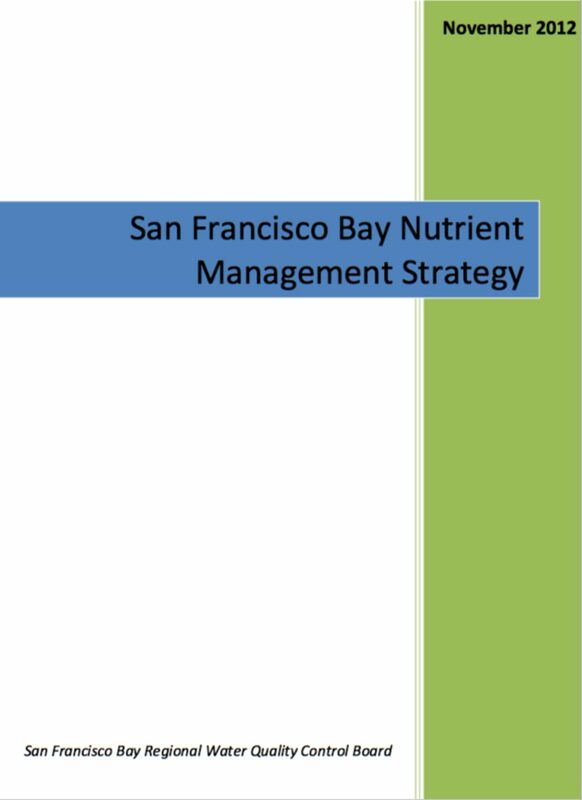 This document presents a draft strategy for developing the science needed to make informed decisions about assessing nutrient impacts on water quality, protecting beneficial uses , and managing nutrient loads to San Francisco Bay. The document first provides relevant background, after which management decisions related to nutrients are highlighted. 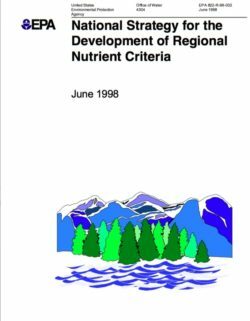 The document then lays out a plan, developed collaboratively by the San Francisco Regional Water Quality Control Board (Water Board) and Bay stakeholders, for the technical studies required to support decisions regarding nutrient management . This report is one of a series of publications, The Quality of Our Nation’s Waters, which describes major findings of the NAWQA Program on water-quality issues of regional and national concern. This report presents an assessment of the occurrence and distribution of nutrients in the Nation’s streams and groundwater based on water-quality data from about 500 streams and over 5,000 wells collected from 1992 through 2001. Other topics addressed include the relation of nutrient conditions to aquatic life in streams, changes in nutrient conditions from 1988 through 2004, and implications for future changes. The information in this series is intended primarily for those interested or involved in resource management and protection, conservation, regulation, and policy-making at regional and national levels. In addition, the information is relevant to those at a local level who wish to know more about the general quality of streams and groundwater in areas near where they live and how that quality compares with other areas across the Nation. 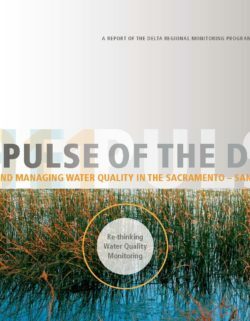 Welcome to the first issue of the Pulse of the Delta: Monitoring and Managing Water Quality in the Sacramento – San Joaquin Delta, the new publication of the emerging Delta Regional Monitoring Program (RMP). This report is a direct response to Delta RMP stakeholders’ desire for an accessible water quality summary for the Delta that addresses important regional questions. Did Contaminants Play a Role in the Pelagic Organism Decline? The KEY TOPIC article introduces this year’s theme, LINKING SCIENCE AND MANAGEMENT THROUGH REGIONAL MONITORING (PAGE 6). The MANAGEMENT UPDATE section provides updates on Delta RMP development (PAGE 12) and the U.S. Environmental Protection Agency (EPA)’s Delta Clean Water Act evaluation (PAGE 18). It further provides an update on the development of Nutrient Numeric Endpoints for San Francisco Bay, due to the relevance of this topic to Delta stakeholders (PAGE 28). And as a new feature, the Management Update section now also provides a regulatory status update for pollutants of concern. 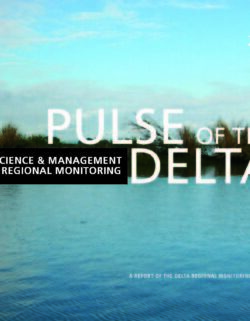 This edition of the Pulse of the Delta introduces a NEW STATUS AND TRENDS section with updates on important monitoring results (PAGE 44) and leading indicators (PAGE 50) for the Delta. The STATUS AND TRENDS section was made possible thanks to significant contributions by the Interagency Ecological Program, U.S. Geological Survey, the Central Valley Regional Water Board, California Department of Fish and Game, California Department of Water Resources, and scientists at the UC Berkeley and San Francisco State University Romberg Tiburon Center. Two FEATURE ARTICLES provide an overview of recent research findings that could help wetland managers reduce the methylmercury problem and a glimpse into the future of the Interagency Ecological Program (IEP). One of the main challenges as ecosystem restoration efforts are moving forward will be the mercury problem. Large-scale restoration of wetland areas will be required to provide a sufficient amount of aquatic habitat for restoring the Delta ecosystem. At the same time, water quality managers will need to identify actions to protect people and wildlife from exposure to methylmercury that may originate from restored wetlands, due to a legacy of mercury contamination in Delta soils. Recently completed and ongoing studies in the Yolo Bypass provide new information on management options for controlling methylmercury production in wetlands and offsite transport (PAGE 66). IEP scientists have been monitoring and researching the San Francisco Estuary since 1970. Now the IEP has arrived at an important crossroads, and its future is being decided at the same time as environmental managers are determining what a desirable future ecosystem would look like, how it would function, and how it can be established (PAGE 76).